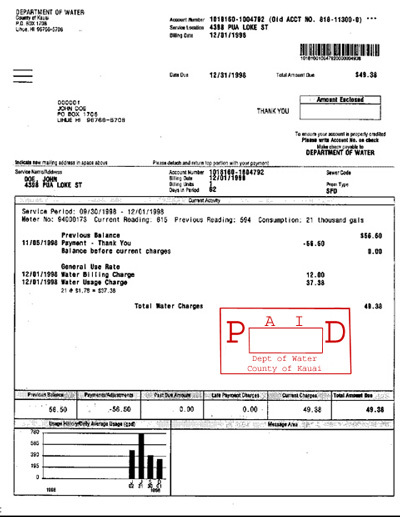 Now you can pay your water bill AUTOMATICALLY! The Kauai Department of Water invites you to select an easy way to pay your water bill with our new Automatic Bill Payment (ABP) service. Your participating bank, savings and loan, or credit union can pay your water bill by deducting the amount due automatically from your financial account. Save on writing checks, stamps, and envelopes. Please fill in the authorization form* and leave your water bill payments to ABP. What happens when I signup for an Automatic Bill Payment? You will authorize your financial institution to automatically deduct the amount due for your water bill. Deductions will be made ten (10) days after your water bill is mailed, giving you enough time to review the bill and call the Kauai Department of Water if you have any questions concerning your bill. How much does the ABP service cost? Can I stop payment at any time? You may stop your automatic bill payment by calling the Kauai Department of Water ten (10) business days before the payment is scheduled to be made. Whom may I call if I have any questions on Automatic Bill Payment? You may call the Department of Water at 245-5400 if you have any questions. Or you may contact us via e-mail. A form to begin the automatic bill payment is provided for you online. You will need to print out this form and fill in the required information, sign and mail it along with a check marked “VOID” showing your complete financial account number and the name of your financial institution. You must have Adobe Acrobat Reader to view and print the form.